Aizawl, Dec 9 : Counting of votes for the 40 assembly seats of Mizoram will begin at 8 am on Monday amidst tight security. Nearly 82 percent, a record number, had casted their votes in the state assembly elections. The poll battle is mainly between the ruling Congress and the alliance of Mizo National Front and Mizo People's Conference who have formed the Mizoram Democratic Alliance. Chief Minsiter Lalthanhawla is facing anti-incumbency this time, say political experts. This poll will decide the fate of 142 candidates, including six women and many independents. Political parties have expressed their happiness over the heavy turnout of voters and peaceful elections. The opposition Mizoram Democratic Alliance is a coalition comprising Mizo National Front (MNF), Mizoram People's Conference and Maraland Democratic Front, all regional and local parties. The Bharatiya Janata Party, which has little base in the state, Zoram Nationalist Party and the Nationalist Congress Party are also separately contesting the state elections, fielding candidates in many seats. Of the 40 assembly seats, 39 are reserved for tribals. One seat is for the general category. With a population of 10.91 lakh, Mizoram is the only state in India where women voters outnumber men by 9,806 in the total of 690,860. In all, there are 350,333 women voters against 340,527 males. Altogether 1,126 polling stations were set up across the state to hold the elections. Mizoram shares borders with Myanmar (404 km) and Bangladesh (318 km). A newly-designed device -- Voter-Verified Paper Audit Trail (VVPAT) which confirms to a voter that his or her vote was cast as wished -- was "used in 10 of the 40 assembly segments of Mizoram", an election official said. This is the first time that this device has been used in any general election in the country. 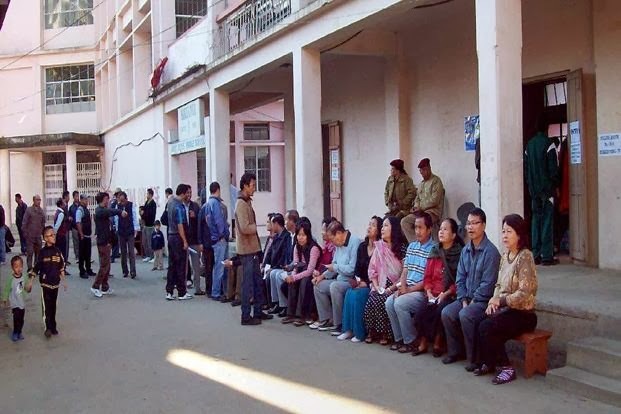 Even though there is no major security threat from separatist outfits and Mizoram remained peaceful during the month-long electioneering, around 7,000 para-military, state and other security personnel were deployed to ensure free and fair polls in the state. Christian- and tribal-dominated Mizoram witnessed peaceful campaigning under the close watch of the powerful church-controlled Mizoram People's Forum (MPF), a non-government election watchdog. Mizoram Police chief Amulya Patnaik is hopeful that the counting process will pass off peacefully. Monday's counting will decide the political fortunes of Chief Minister Lal Thanhawla, his eleven cabinet colleagues, Mizoram Women's Congress chief Tlangthanmawii and former chief minister and MNF president Zoramthanga. Lal Thanhawla, also state Congress chief, is contesting from two constituencies -Serchhip, his home turf, and neighbouring Hrangturzo - and opposition MNF chief Zoramthanga is trying his electoral fortunes from Tuipui East, bordering Myanmar. During the last assembly elections of December 2008, the Congress won 32 seats, the MNF three and the MDF one. The MPC and ZNP got two seats each.